The current Minister of Water and Sanitation served previously as Minister of Rural Development and Land Reform. He has a Masters Degree in Public Policy and Management from the University of London, and Bachelor of Administration Degree specialising in Political Science, Public Administration and Applied Economics from the University of South Africa. He was appointed Minister of Water and Sanitation in February 2018. Deputy Minister of Water and Sanitation.Ms Tshwete’s past parliamentary positions have been Chairperson of PC Arts & Culture; Chairperson of Ad hoc Committee on Filling of Vacancy on Commission for Gender Equity; Whip for PC Joint Monitoring Committee on the Improvement of Quality of Life & Status of Women; Women's Caucus.She was appointed Deputy Minister of Water and Sanitation in May 2014. Currently serves as Chairperson of the Board of Midvaal Water. Mr Dikoko has vast knowledge in Local Government Legislation derived from the Constitution and Local Government White Paper. He also has in-depth understanding of structure and inter-relationship of the three spheres of Government, as well as ASGISA and JIPSA programmes. Has served as Executive Mayor of the most established District Municipality in the North West Province. Currently serves as Chairperson of the Board of Lepelle Water. Re-joined Umgeni Water in November 2014. General Manager: Operations. His previous places of employment were: Shell and BP Petroleum; Umgeni Water and uThukela Water, where he was Managing Director before he re-joined Umgeni Water as General Manager: Operations in November 2014. Appointed as General Manager Engineering and Scientific Services in 2012. Director of Msinsi Holdings (Pty) Ltd from 2012. Planning Manager from 1999 to 2012. 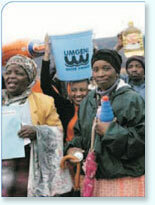 Engineer Umgeni Water from 1997 to 1999. Engineer with the Department of Water Affairs from 1984 to 1997. BCom degree from the University of South Africa, a Management Development Programme qualification from UNISA and an International Management and Marketing Programme qualification from HPTI Uberseezentrum in Germany. Appointed as General Manager: Corporate Services January 2014. Ms Moleko has held a number of leadership positions at various organisations, including the Eskom Leadership Institute, Eskom Transmission, MERSETA and South African Airways as well as the lead consultant and Director of Moketenyana HR Solutions. Phillips is currently the Acting General Manager: Finance, a position she has held from August 2017. Prior to the Acting appointment, Ms Phillips had been Finance Manager from 2007. She was previously employed at Deloitte (trainee Accountant 2003-2005 and then Audit Senior on Secondment to Philadelphia in the United States for three months in 2006). LLB (UZ); Postgraduate Diploma in Compliance (UJ). Appointed as Company Secretary on 1 January 2014. Umgeni Water Legal Services Manager until December 2013. Prior to that he was the Competition Commission’s Legal Counsel. Has extensive experience in private legal practice.